Book Horde: Friday Freebies: Two Free Books From Dale Amidei! Friday Freebies: Two Free Books From Dale Amidei! Here's a great way to check out a conservative writer of military fiction set during the Iraq War. Dale Amidei has two FREE Kindle books he is giving away. The first is the short story Romeo Down. Where does a man's strength originate? In 1991, during the short, brutal air war above Iraq, two men unknowingly discover the same answer during an intense CSAR (Combat Search And Rescue) operation. 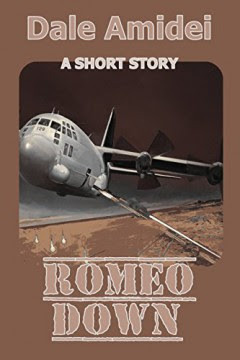 A short story, "Romeo Down" is an account of the action resulting in the award of Daniel Sean Ritter's first Silver Star. Alluded to in dialogue within the first novel of "Sean's File," "Operation Naji," this episode stands alone as a spoiler-free companion volume to that title. 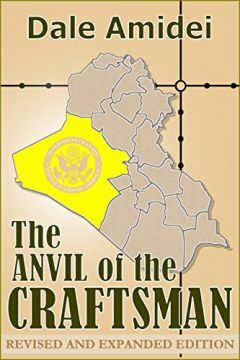 Also free is his his novel The Anvil of the Craftsman, which is the first book in "Jon's Trilogy". "You have love, hate and indifference. Choose." A doctoral candidate in Theological Studies accepts recruitment by a friend in the U.S. State Department for an initiative to the most troublesome province in 2006 Iraq. The many challenges of nation building expand the mission from diplomacy to a survival situation as local and international interests position themselves to oppose a State Department initiative: one vital to progress in an uncertain theater. Terrorism and counter-terror operations threaten to keep the team from leaving the relative safety of Baghdad. Until, that is, a former USAF Special Tactics operative hunting the men who want to kill them draws duty as their protector. The simple questions posed during a tribal council threaten provincial and regional stability; the conclusions reached explode into a clash of faith, loyalty, schism and betrayal that will help shape the future of two nations.